MANILA, Philippines-The ancient healing art of Hilot was recently featured on ABS-CBN’s Hiwaga, a thirty-minute TV program devoted to seemingly “mysterious” phenomena. In the episode entitled, “Lunas” (“Cure”) aired on January 24, host Atom Araullo showcased Hilot, Acupuncture, and Tawas. Hilot was tackled in the first segment of Hiwaga. For the case study, the program chose to feature the story of Menchie Aduan-Francisco, an international flight attendant who was able to conceive her second child after undergoing Hilot sessions at ATHAG. In the interview, Menchie related how she had difficulty conceiving following a miscarriage, and was diagnosed as having polycystic ovaries. Consequently, she was put on medication to correct her hormonal imbalance. Five years later, however, she still didn’t see any change in her condition and so she told her doctor that she didn’t want to take medicines anymore. One day, a friend who was going to the ATHAG office for a Hilot session invited Menchie to come along with her. Curious, she went with her friend so that she, too, could also experience Hilot. There, Dr. Bibiano “Boy” Fajardo performed traditional diagnosis and explained to them what Hilot is—it is not simply massage as most people think, he clarified, but rather, it is physical manipulation to correct and ease the flow of energy through the body. He also explained that herbs are often taken in conjunction with Hilot in order to flush out toxins that have accumulated in the body. Menchie was pleasantly surprised to feel subtle changes in her body after her Hilot sessions. Soon, she was overjoyed to find that she was finally pregnant! When she broke the news to her husband, they happily went over their activities the previous month to find out what had changed in their routine that contributed to the conception. There was only one addition—Hilot. After the re-enactment of Menchie’s story, her doctor was again shown, saying that it is possible that her pregnancy was still due to the medication. 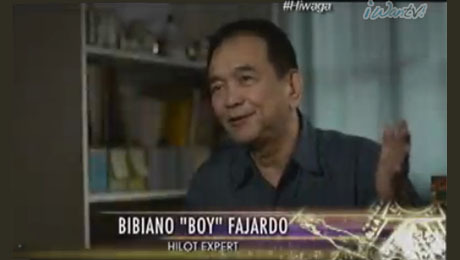 Unfortunately, the segment on Hilot ended at that point— leaving Hilot as mysterious to the viewer as in the beginning of the program, and not taking the opportunity to demystify Hilot by having Dr. Fajardo explain the scientific basis on how Hilot helps couples conceive (so we will just explain it here). So how does Hilot help women (and couples) who have difficulty conceiving? The Hilot approach is two-fold—through herbs, and physical Hilot manipulation. Depending on the result of traditional diagnosis, herbs may be prescribed to balance the woman’s hormones. As you can see, this is the equivalent of drugs or medications for hormonal imbalance that doctors order their patients to take—except that the herbs are from natural plant sources, and not synthesized in a laboratory. Meanwhile, men who have hormonal problems are instructed to take in specific food in order to boost their testosterone levels. In addition to addressing hormonal imbalance, Hilot manipulation is performed to ensure a sufficient flow of energy to the reproductive organs, which may be sluggish or not functioning properly. So the next time you hear of someone wishing to have a baby going to a manghihilot, you know why and how Hilot can help. Do you also want to try and experience traditional Hilot? For inquiries or appointments, please call the Association of Traditional Health Aid Givers, Inc. (ATHAG) at (0922) 884 4568 or 267-4012. The ATHAG office is open Mondays to Saturdays, 8:00 a.m. to 7:00 p.m.